India has 12 million children living with disabilities, and only 1% of them have access to school. About 80% of children with disabilities do not survive past age 40. Many conditions such as mental retardation, developmental disabilities, cerebral palsy, craniofacial abnormalities, and seizure disorders can impact a child's oral health. Children with SHCN generally have increased prevalence of poor oral hygiene, compromised gingival and periodontal health, and increased prevalence of dental caries than the general population. Dental diseases and its treatment present several problems in this group of patients. These children may not understand or assume responsibility for preventive oral health practices. Many caregivers do not practice appropriate oral hygiene or choose a proper diet. Their parents also have the burden of medical treatment. They usually do not seek dental treatment. Moreover, the importance of dental care for these children has often been overlooked by the health planners. 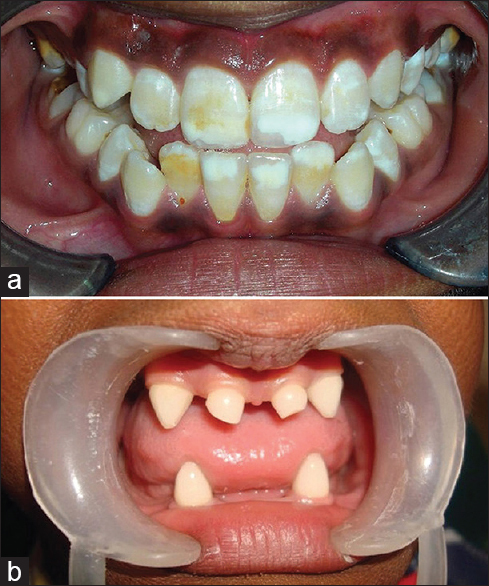 This paper reviews commonly seen oro-dental problems in children with special needs and causes of their increased prevalence, various barriers to accessing dental care, and management of oral diseases in this population of children. By understanding potential barriers to oral health care and consequences of poor oral health in children with SHCN, health professionals can identify at-risk patients early, provide anticipatory guidance, and refer to pediatric dentists. The dental condition of children with SHCN may be directly or indirectly related to their disabilities. Growth abnormalities and medical conditions may adversely affect oral health. Oral diseases may also have a direct and devastating impact on the general health of special children. Following are the commonly seen oral problems in children with special needs. Intake of medications containing sugar like flavored syrups. 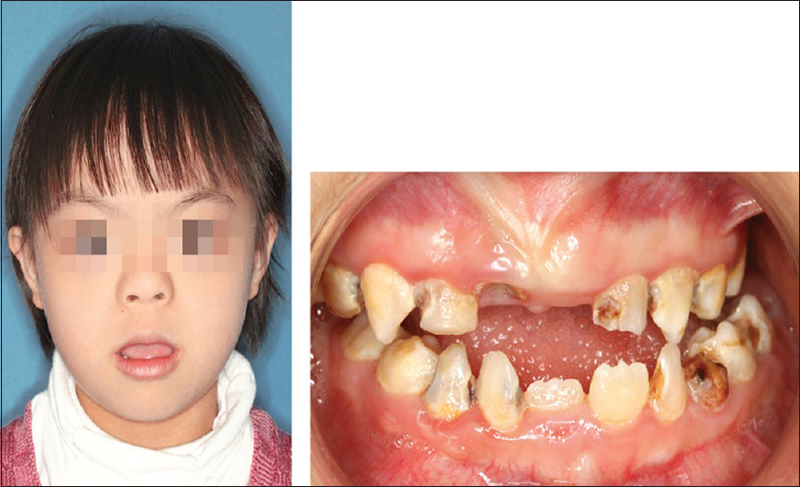 Children with low birth weight, developmental delays, or certain genetic syndromes may be at increased risk for enamel hypoplasia - a predisposing factor for dental caries, especially in the maxillary incisors and primary molars [Figure 2]a.
Tooth eruption may be delayed, normal, or advanced in children with SHCN. Delayed eruption is more common in children with Down syndrome and hypothyroidism [Figure 2]b. Teeth may vary in shape, size, or number [Figure 3]a. Teeth with anomalies are usually of cosmetic concern and may increase the risk for caries. Malocclusion and crowded teeth occur more often in children with abnormal muscle tone (cerebral palsy), mental retardation, and craniofacial abnormalities. Malocclusion is the result of disharmonious relationship between extraoral and intraoral musculature, for example, in the spastic type of cerebral palsy, there is hypertonicity of facial muscles which results in the constriction of maxillary and mandibular arches resulting in anterior open bite [Figure 3]b and posterior crossbite. Whereas in athetosis type of cerebral palsy, the facial musculature is hypotonic and there is flaring or spacing between teeth. Crowded teeth are more difficult to clean, thereby increasing the risk of dental caries and periodontal disease. 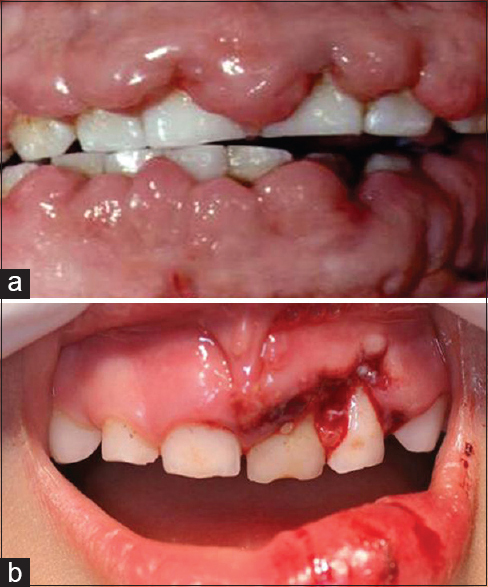 Gingival hyperplasia usually occurs in children taking antiepileptic medications for seizures, especially phenytoin [Figure 4]a. Other medications such as calcium channel blockers (nifedipine) and cyclosporine A may also cause gingival hyperplasia. Chronic gingivitis from poor hygiene can also trigger or exacerbate medication-induced gingival overgrowth. In addition to cosmetic concern, gingival hyperplasia may result in impaired tooth eruption, difficulty in chewing, and severe gingivitis. Trauma to the face and mouth occurs more frequently in children with seizures, developmental delays, poor muscle coordination, and abnormal protective reflexes [Figure 4]b. Some children with special needs exhibit self-injurious behavior which may damage oral structures. It is more common and often more severe in children with cerebral palsy or severe mental retardation, those who have oral motor habits. Bruxism can lead to enamel loss and difficulty with chewing or tooth sensitivity. It can lead to wear on the teeth, flat tooth surfaces, headaches, pain, and gingival disease. Planning for prevention of further disease. Treatment of dental diseases in special children is the same as carried out in other children except that they may require sedation even for routine cleanings, restorative procedures, and minimal oral surgery. If there is concern about a child's cooperation or ability to tolerate oral manipulation, he/she should be considered for referral to a pediatric dentist or a specialist with training in sedation. Daily home preventive dental care may have to be tailored to meet the specific needs of the child. This is often best addressed by the dental and other health professionals involved in caring for the child. Patients with SHCN who have a dental home are more likely to receive appropriate preventive and routine care. Fluoride rinses: Should be used only for children who can swish for 1 min and spit. Many children with oral motor dysfunction tend to swallow the rinse, so it can be applied with a cotton swab, or other form of fluoride should be used. Alcohol-free rinses should be used. This is especially beneficial for children who are unable to use home oral rinses with fluoride or who are at high risk for dental caries [Figure 6]a.
Adaptations may be needed for children who have oral motor dysfunction (e.g., abnormal reflexes or muscle control) or oral hypersensitivity (e.g., overreaction to touch, taste, or smell). Gel or foam applied in trays requires frequent use of suction to prevent choking, excessive drooling, or aspiration. Trays may trigger hyperactive gag reflexes; brushing on the gel or foam for the same amount of time while using suction may be more effective. 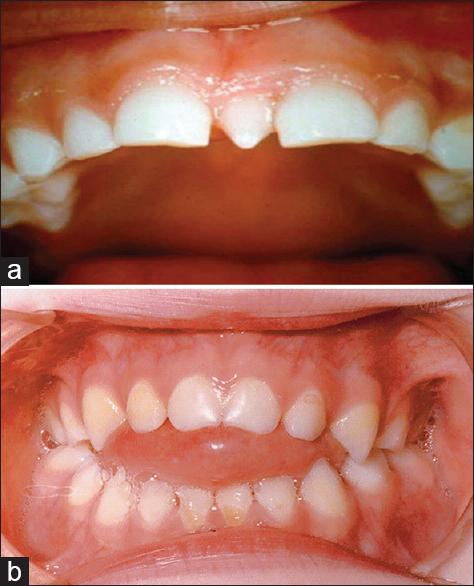 Fluoride varnish may be the best type of professionally applied fluoride for children with SHCN [Figure 6]b. It should be applied every 3–6 months in children who are at increased risk for dental caries. Antimicrobials are especially recommended for children with chronic diseases or disorders such as leukemia, kidney failure, immune deficiencies, or Down syndrome, in conditions where there is moderate to severe gingivitis or periodontitis at an early age or more fungal infections or other opportunistic infections. Antimicrobial rinses should be used only in children who can swish and spit. Xylitol: A low-calorie sugar substitute used in certain chewing gums. Short-term exposure to xylitol has been shown to decrease S. mutans levels in saliva and plaque. It has additive dental caries preventive effect with fluoride. Children over age 3 can use xylitol if they are able to chew gum without choking. Xylitol should be used for 3–5 min per se ssion, three to five times per day. 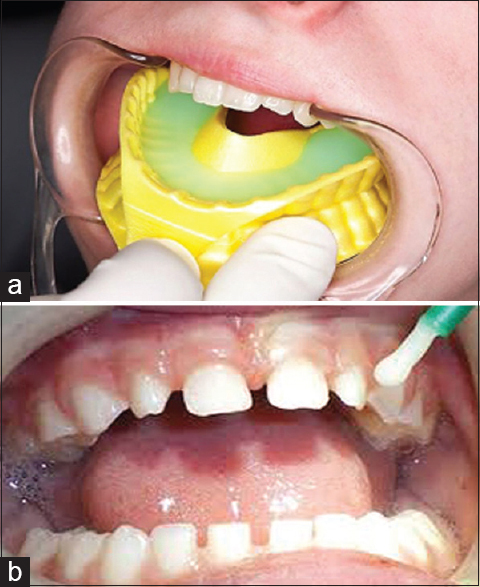 Children cooperate with dental sealant application since its application does not require an injection or the placement of a rubber dam [Figure 7]. Children who severely brux their teeth (e.g., because of cognitive disabilities, cerebral palsy, or autism) may not be candidates for dental sealants because of the flattened occlusal surfaces. 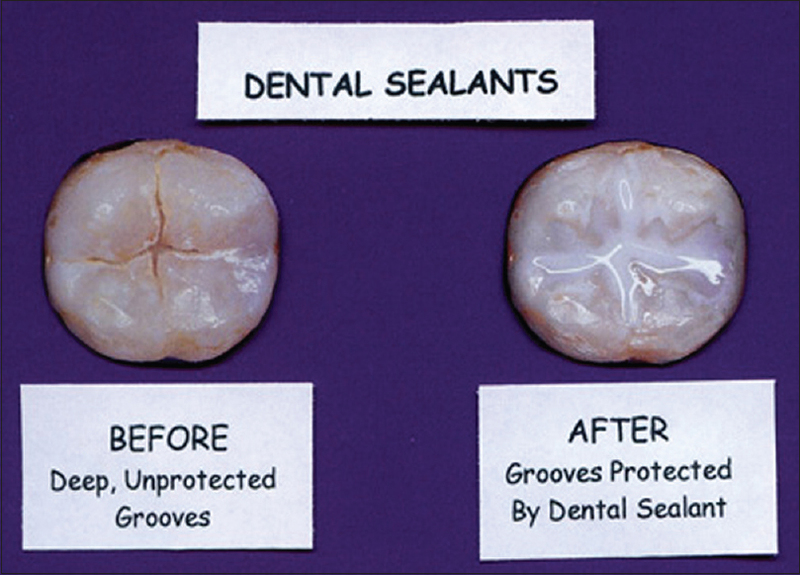 Wet bond dental sealants can chemically bond to moist teeth and do not require dry field for application process. However, isolating the working field may be difficult with some children who have oral motor dysfunction. Efficient and effective suctioning is essential for successful application of dental sealants. Some children with SHCN develop excessive calculus caused by mouth breathing, inadequate salivary flow, metabolic disorders, kidney failure, tube feedings, oral motor dysfunction, or inadequate oral hygiene. Hand scaling may be done. The oral examination of a child with special needs is similar to the routine child oral examination. Oral defensiveness, increased gag reflex, and oral motor hypotonicity may make the examination more difficult and should be documented. The primary care physician should make increased efforts to complete an examination checklist. Practitioners should examine the following areas and document abnormalities: Oral-facial anomalies, teeth, gingiva, and palate. Early referral to a pediatric dentist will ensure complete examination of all oral structures. Payment for dental care: Multiple visits and costly dental treatment add to the financial burden on parents. Any child with evidence of caries, gingival, or eruption anomalies should be immediately referred to a pediatric dentist. General health and oral health go hand in hand. Children with SHCN are at increased risk for various oral diseases which can adversely affect their quality of life. Dental care for these children has been given less attention by their families and health professionals. Let us all join hands and be aware of our responsibilities and services for these “God's forgotten children” as they certainly deserve the best that medical and dentistry has to offer as an important part to their total habilitation. American Academy of Pediatric Dentistry. Definition of special health care needs. Pediatr Dent 2013;34:16. Available from: http://www.childlineindia.org.in. [Last accessed on 2016 Nov 28]. American Academy of Pediatric Dentistry. Reference Manual. Guidelines on management of dental patients with special health care needs. Pediatr Dent 2008;37:166-71. Rodrigues dos Santos MT, Masiero D, Novo NF, Simionato MR. Oral conditions in children with cerebral palsy. J Dent Child (Chic) 2003;70:40-6. Nelson S, Albert JM, Geng C, Curtan S, Lang K, Miadich S, et al. Increased enamel hypoplasia and very low birthweight infants. J Dent Res 2013;92:788-94. Rahul VK, Mathew C, Jose S, Thomas G, Noushad MC, Feroz TP. Oral manifestation in mentally challenged children. J Int Oral Health 2015;7:37-41. Miamoto CB, Ramos-Jorge ML, Pereira LJ, Paiva SM, Pordeus IA, Marques LS. Severity of malocclusion in patients with cerebral palsy: Determinant factors. Am J Orthod Dentofacial Orthop 2010;138:394.e1-5. Barzel R, Holt K, Isman B. Special Care: An Oral Health Professional's Guide to Serving Young Children with Special Health Care Needs. Available from: http://www.mchoralhealth.org/SpecialCare. [Last accessed on 2016 Nov 28]. Lewis CW. Dental care and children with special health care needs: A population-based perspective. Acad Pediatr 2009;9:420-6. Little JW, Falace DA. Dental Management of the Medically Compromised Patient. 2nd ed. The C.V. Mosby Company; 1984.